You are buying the Dr. Scholl's Orthotics Back Pain Relief For Men Fits 8-13 Pair, Model #40487. ADW Diabetes offers a wide range of Dr. Scholl's products including diabetic socks, specialty insoles, and foot care products geared towards achieving better foot health. ADW Diabetes offers all of our Dr. Scholl's products in singles and bulk packs for your convenience. Trust ADW Diabetes for low prices and superior service. 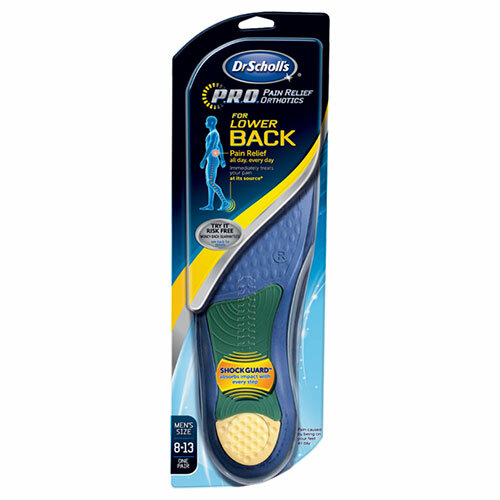 Dr. Scholl's Orthotics Back Pain Relief For Men Fits 8-13 Pair - Model #40487 prevents every step you take from sending shocks that travel up your leg and into your lower back. Dr. Scholl's P.R.O. Pain Relief Orthotics for Lower Back are clinically proven to immediately treat lower back caused by being on your feet all day at its source.